Kinderglo is a company that makes nightlights in different animal shapes. I chose the owl nightlight to review and learned that it is quite a neat product. The Kinderglo nightlight does not need to be plugged in to work. You can charge it ahead of time and then take it wherever you need to go. I think that this will be perfect to use for our baby for middle of the night feedings and diaper changes when we need some light but not too much. One of the neatest uses for this nightlight would be for toddlers or kids to take it with them when they need to see. For example, if they need to go to the bathroom when it is dark out, this would be great to take with them since it is portable and safe. I chose the owl design since I thought that that was the cutest but they also have other fun animals such as a dragon, bear, elephant, hippo and more. Each light retails for $24.95. Each of the lights having different color settings including solid green, solid red, solid blue, or continuous color changing. 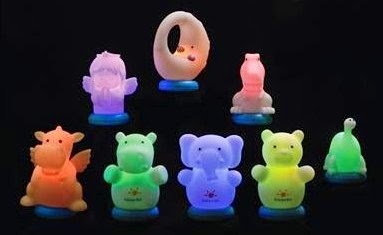 The giveaway will be for your choice of Kinderglo Nightlight to one reader. Thanks for the chance to win! These are so cute! Thank you for a chance to win a KinderGlo night light for my little grandson.I think they are adorable and I love the Dragon.